This document will provide detailed instructions to enable OAuth V2 authentication on Teiid’s OData interface using the Keycloak as authentication server (IDP). Please note that use a different IDP server will not work with this implementation as OAuth2 implementations are not interoperable. To work with separate IDP than Keycloak consult their documentation, replace the web layer semantics, like the "login-config" in web.xml file etc. Providing the details of other IDP is beyond the scope of this document. This examples will show case an example, where Teiid’s OData rest interface is secured using OAuth using Keycloak using OpenID Connect. The VDB accessed by the OData interface also depends on another web service which is used as a data source, that is also secured with OAuth using the same Keycloak IDP. The central idea behind this example is to pass the same "access-token" used at OData interface layer to passthrough the Teiid layer to bottom data source layer and gain access to the source. Download and install Keycloak as a separate web server. Login using the default "admin/admin" credentials into the Keycloak "master" realm. 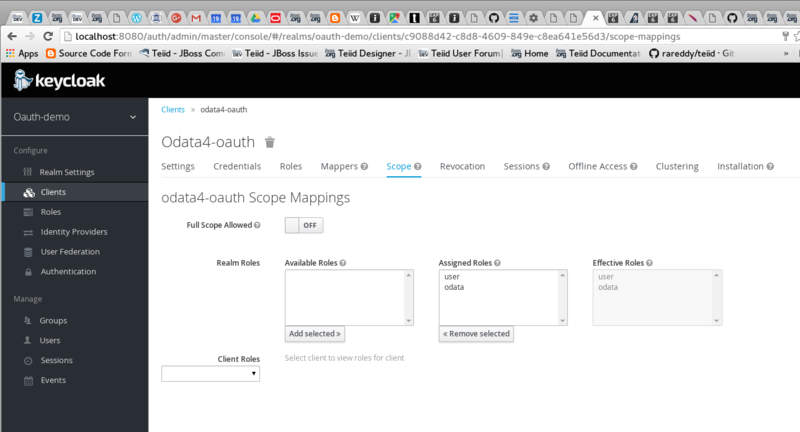 Add a new realm called "oauth-demo"
Add a new user called "user" and add credentials. Add two roles "odata" and "user". These are enterprise roles, that will be used by the web services to grant the access to user. Also these roles are used as "scopes" in the OAuth protocol. and choose scopes "odata" and "user" for this client. Note that the redirect URI needs to be where the actual service is going to be available. The client web-service typically defines what roles that logged in user must have in order for to grant the access. In the Keycloak OAuth implementation, these roles are used as "scopes". Note that the "odata4-oauth" client MUST have ALL the scopes that it is going to delegate the access-token for gaining access to bottom data services. In this example Teiid’s OData web services requires "odata" role, the bottom web-service requires the "user" role. Since the OData accesses the bottom web-service it requires both the roles. 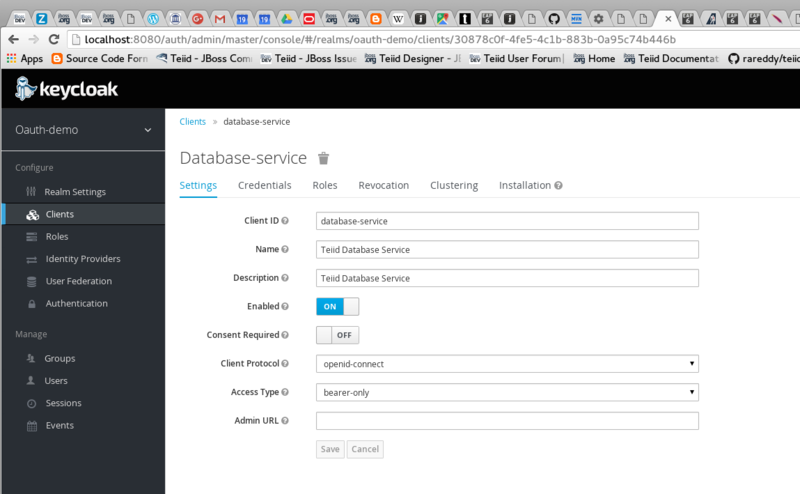 Add another client called "database-service" and choose scope "user". Choose type as "Bearer". Download Keycloak adapter for the EAP, and unzip over the Teiid server installation or follow Keycloak installtion directions. Now, start the Teiid Server and using the jboss-cli.sh file run the following to install the KeyCloak configuration into the Teiid Server. Then we need to change the OData transport’s "security-domain" to "keycloak". The Keycloak is installed and the OData transport is modified, now we need to install security-domain called "passthrough". Note that the web layer is using OAuth2, but at the VDB layer, this logged in user need to be passed through and this security domain will help with that. 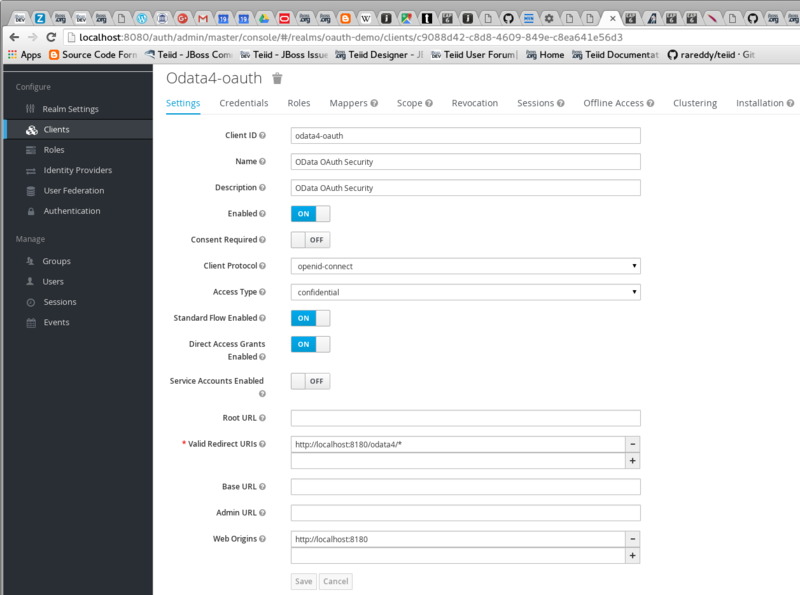 This finishes all the server side changes that are required to make OAuth authentication using Keycloak. In order to use OAuth2 authentication, the OData WAR needs to be updated to make use of the OAuth2 based security domain. By default Teiid installation comes with OData web service WAR file configured with "HTTP Basic" authentication. This WAR needs to either replaced or updated. Build the new OData WAR file that supports OAuth. The above link provides templates for creating two WAR files, one WAR file is to create Teiid’s OData service with OAuth, the next is a sample "database-service" for this demo. Please note that "database-service" is to mimic the database service, that will be different in a real use-case, however the steps defined for the access will be same. Replace the "teiid-web-security/teiid-odata-oauth-keycloak/src/main/webapp/WEB-INF/keyclock.json" file contents with "installation" script in "keycloak.json" format from Keycloak admin console’s "odata4-client" client application. Similarly replace the "teiid-web-security/examples/database-service/src/main/webapp/WEB-INF/keyclock.json" file contents with "installation" script in "keycloak.json" format from Keycloak admin console’s "database-client" client application. The above command will generate a new WAR file for deployment. Follow the below directions to deploy this new WAR file. If you are working with JDV 6.3 server or greater, then run the following CLI script, you may have change the below script to adopt to the correct version of the WAR and directory names where the content is located. where all ports are offset by 100. So the management port is 10090 and default JDBC port will be 31100. The Keycloak server is started on default ports. There are two different mechanisms for testing this example. One is purely for testing the using the browser, then other is programatically. Typically using the browser is NOT correct for accessing the Teiid’s OData service, but it is shown below for testing purposes. The user will be presented with Keycloak based login page, once the credentials are presented the results of the above request are shown. This process of calling does not need to involve a web-browser, this is typical of scenario where another web-application or mobile application is calling the Teiid’s OData web-service to retrieve the data. However in this process, the process of negotiating the "access-token" is externalized and is defined by the IDP, which in this case is Keycloak.